By combining outdoor elements such as ceremonial and abstract floral designs, the Floral Blossom Dining Set by Home Style is brought to life. This set is constructed of cast aluminum in a powder-coated charcoal finish with patterned Weather-resistant burnt sierra leaf polyester cushions. The 42-inch outdoor table and four chairs features hand-applied antiqued highlighting sealed with a clear coat for protection attractive patterned design, 2-inch umbrella hole with black cap, and nylon glides on legs for stability. Elegant design and sturdy construction, this piece is finished off with stainless steel hardware. Assembly required. Set includes 42-inch table, two swivel chairs with cushions, and two armchairs with cushions. Enjoy your outdoor space with the Hampton Bay Cambridge patio furniture set made with beautifully hand-woven wicker and durable steel furniture frames. The patio chairs boast deep, plush weather resistant cushions for ultimate comfort and longevity. The faux wood table has a slat-top surface. Perfect for your porch, patio or sunroom, each patio furniture set includes six dining chairs and one dining table. 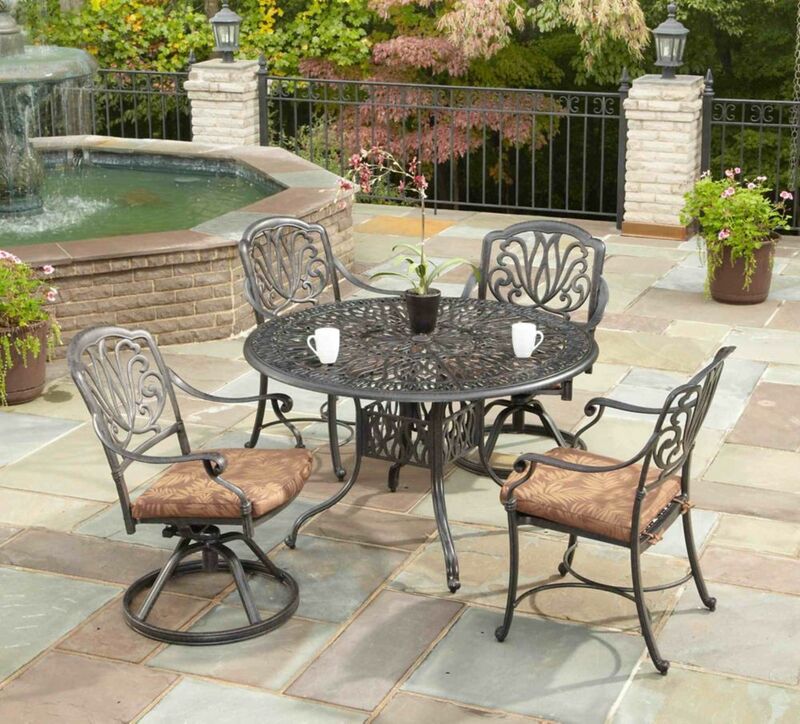 Floral Blossom 5-Piece Patio Dining Set with 42-inch Round Table and Dining Chairs in Charcoal By combining outdoor elements such as ceremonial and abstract floral designs, the Floral Blossom Dining Set by Home Style is brought to life. This set is constructed of cast aluminum in a powder-coated charcoal finish with patterned Weather-resistant burnt sierra leaf polyester cushions. The 42-inch outdoor table and four chairs features hand-applied antiqued highlighting sealed with a clear coat for protection attractive patterned design, 2-inch umbrella hole with black cap, and nylon glides on legs for stability. Elegant design and sturdy construction, this piece is finished off with stainless steel hardware. Assembly required. Set includes 42-inch table, two swivel chairs with cushions, and two armchairs with cushions.